When Apple (finally!) released a smart battery case for the iPhone X, I think most iPhone X owners did a little happy dance. 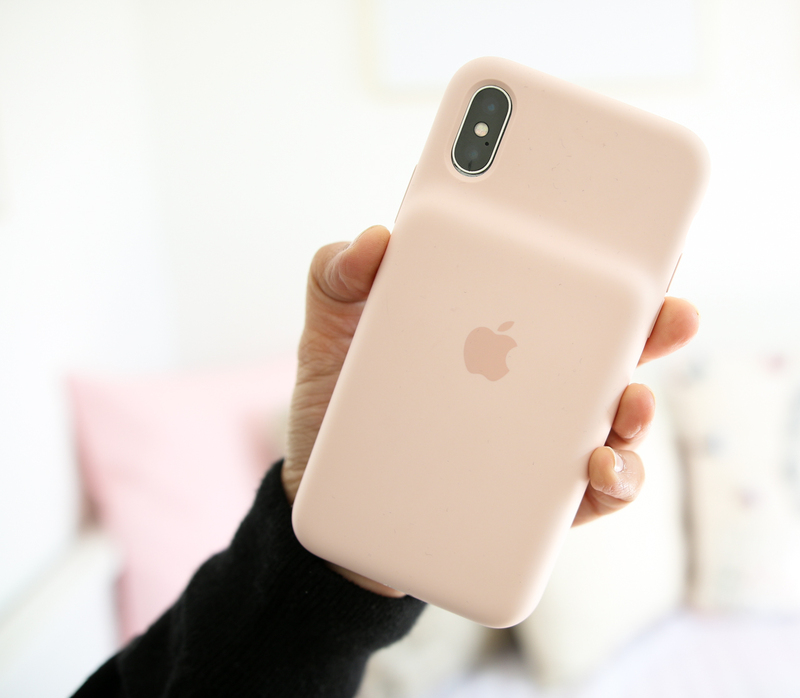 I myself had been waiting for it since I ditched my iPhone 7, quite a few years ago, and the third-party battery cases available just didn’t have the same appeal to me. 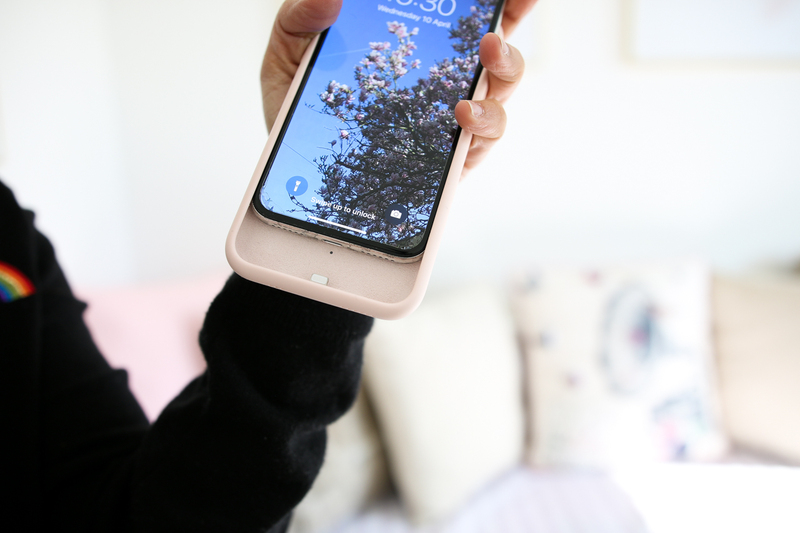 When it was launched late last year, I read some reviews online saying that this case wasn’t fully compatible with iPhone X (my current phone), so that put me off buying it. Turns out it is compatible, although officially, Apple still says on its website that it’s only compatible with iPhone XS. 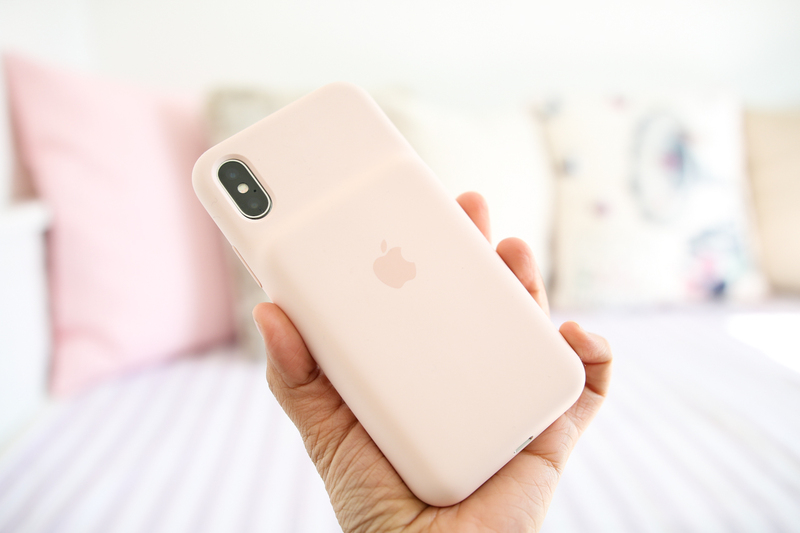 On closer inspection, you can see that the case doesn’t have the right cutouts for the iPhone X speakers and microphone (the bottom left side of the case only has three holes, whereas the iPhone X has six holes either side). But it does work and I haven’t had any problems with charging or sound. 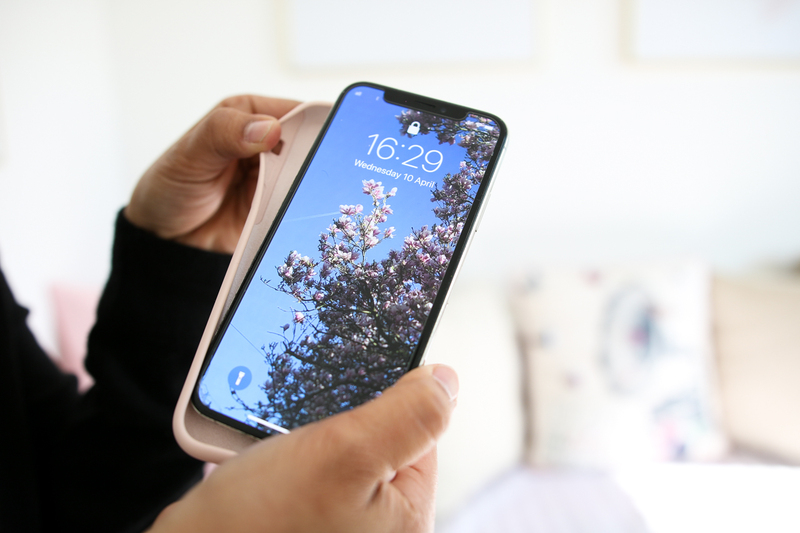 The iPhone XS Smart Battery Case costs £129 (ouch!) and it’s available in White, Black and Pink Sand. There are also two other models that fit the iPhone X Max and the iPhone XR, and they are all priced the same. My previous one for my iPhone 7 was white, so this time I chose the new ‘Pink Sand’ colour, which matches my Apple Watch ‘Pink Sand’ strap. The inside has a soft micro fibre lining and the outside material is a soft silicone with a rubbery grippy feel to it. I’ve already noticed I drop my phone far less than when I have it without the Smart Battery Case. 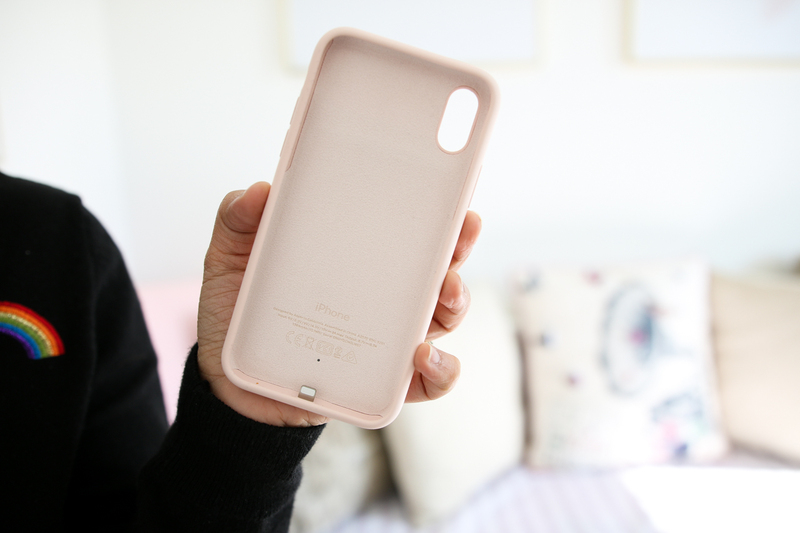 The case plugs into the iPhone’s lightning port and it immediately starts to charge your phone. You can check how much battery your phone and your battery case have by swiping right from the home screen. The Smart Battery Case gives you an extra 100% battery life, which is amazing! It doesn’t make my phone too heavy and bulky; it feels just right. I love how convenient it is; I don’t need a separate charger for it, I don’t even need to take the case off my phone if I don’t want to. 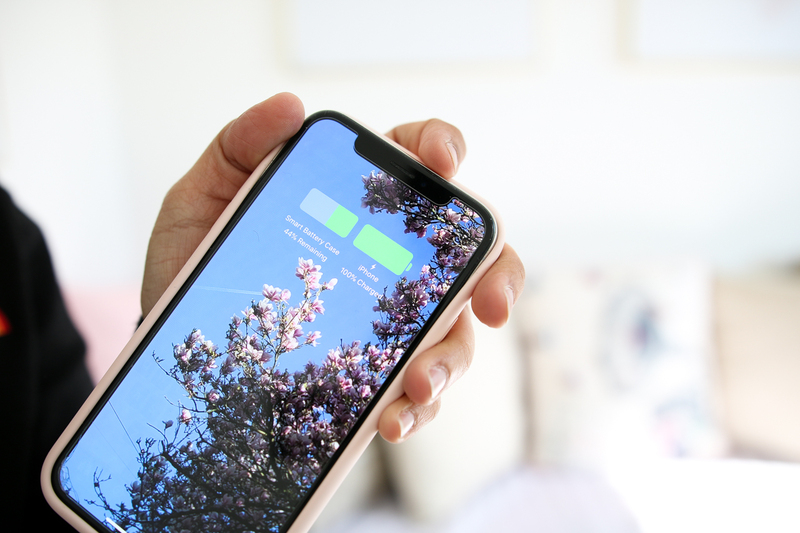 It’s an absolute must-have for me, especially on long days out with the kids (YouTube Kids is a total battery drainer! ), train journeys and as a content creator, who uses their phone all the time for work. If you’re thinking about investing in a Smart Battery Case for your iPhone, I would highly recommend this one. It might be worth popping into your nearest Apple store to have a feel for it, try it on your phone before committing to a rather pricey product. I find the staff very friendly and helpful at the Apple stores I’ve been to, and they are always incredibly knowledgeable if you have any questions. Do you have an iPhone Smart Battery Case? How do you rate it? Have you tried other battery cases? Comment below or chat to me on Instagram!